Your staircase can be anything from an iconic focal point of your living space to a modest, simple passageway. The choice is yours, and there are countless options to truly make it suit the personality, look and feel of your new home. As your floor plans come together, you'll have a sense of how much space you're working with. In addition to choosing where to place a staircase, you'll want to think about how much space to devote to it. Already, you know whether you want it to be a centrepiece or play a more subdued role. Discuss those goals with your home builder, taking into consideration how large the rooms are and how much open area you're comfortable using for stairs. Ask for some quotes from providers or your house designer for a ballpark idea of how much it will cost, and then figure it into your overall building budget to settle on a range. This will give you some parameters as you make further decisions about shape and materials. Combining rich wooden steps with glass siding creates a modern, elegant staircase. You can also play with the landing area, fanning it out as it reaches the lower level. Choose a style based both on your vision for your home design as well as the space and location you've settled on for the feature. Spiral staircases save space and create intriguing shapes, while a broad, straight staircase can make for a dynamic focal point. Keep convenience in mind for location and style, as well. Will you be moving a lot of heavy furniture up and down? Will a steep slope be tough for day-to-day use? Railing and balustrades come in virtually unlimited styles. Is your main goal function or finesse? You can make a real statement with fancy railings, such as elegant ironwork or unique driftwood pieces, or adopt modern, sleek lines with poles or slats. 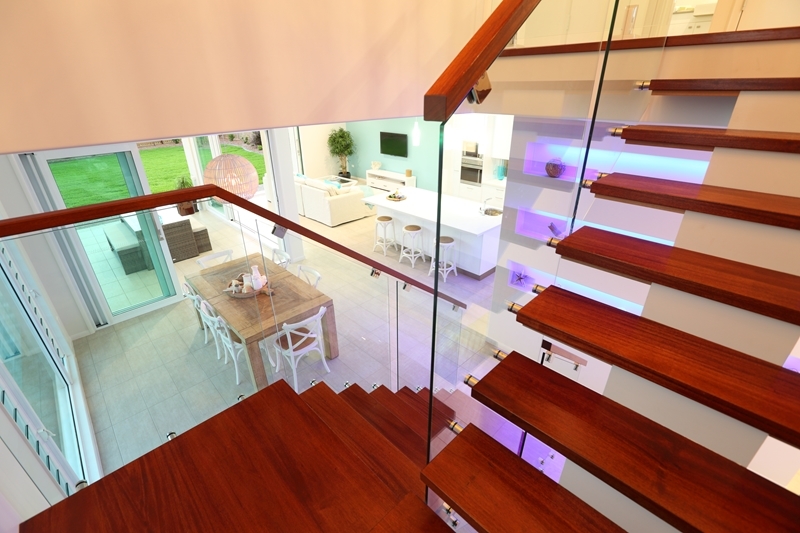 You may even want to minimise the appearance of the handrails, using glass to allow the stairs themselves to stand out. Take safety into consideration, as well. If children or elderly individuals will be using the stairs, ensure the railing offers sufficient support and doesn't contain large gaps where children could slip through or get their heads and limbs stuck. Choose the right materials and style for your staircase so it fits into the overall design of your home. Beyond choosing what the railings are made of, you have several options for materials for the stairs themselves. These come at different price points, and you'll also want to consider convenience and aesthetics. Wood. Can be finished for antique, rustic or contemporary, clean looks. Wrought iron. Strong and durable; great for stylish home decors. Granite. Along with similar materials, excellent for impressive entryways. Carpet. Can cut down on slipperiness while adding a soft look that blend with the surrounding rooms. Glass. More costly, but creates minimalist designs. Concrete or steel. Very robust, often with an industrial or sleek modern appearance. This certainly isn't an extensive list, and many people are combining materials these days, creating very unique looks that make a statement. Keep in mind the ease of cleaning your staircase, such as whether you'll need to vacuum carpet or keep fingerprints off glass elements. Look into whether your area has any special building requirements for staircases, especially in terms of dimensions, load-bearing and railing specifications. 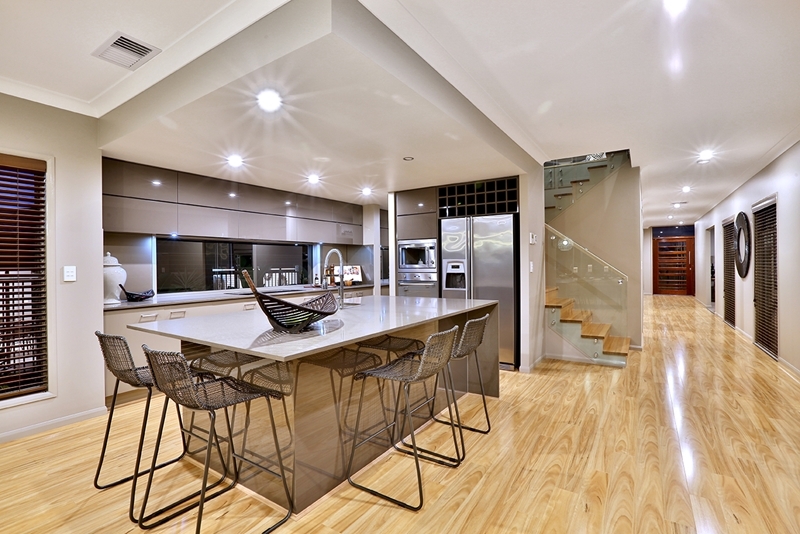 The Building Code of Australia also sets minimum heights for balustrades and handrails. Working with a local home designer who knows the ins and outs of building codes will give you the guidance you need to choose a spectacular style while meeting the necessary stipulations.